Independent medical examinations - when can they be requested? Making reasonable adjustments - what adjustments are considered reasonable? Adrian commenced with Williamsonlegal (now known as WilliamsonBarwick) in the role of Special Counsel in July 2015. In 1995, Adrian was admitted as a legal practitioner of the Supreme Court of New South Wales, having completed a Diploma of Law (SAB) in 1994. From 1995 to 2001, Adrian worked for a progressive Sydney plaintiff law firm, specialising in personal injury and insurance law. In 2001, he graduated from the University of Technology, Sydney with a Master of Laws, having majored in commercial law. 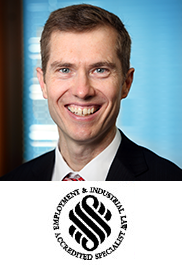 In 2005, Adrian qualified as a Law Society Accredited Specialist in Employment & Industrial Law. He has presented at state and national conferences on a range of topical issues falling within his field of expertise. In the period 2001 to 2015, Adrian practised on his own account and then with a boutique commercial law firm, providing advice and representation in a wide range of Employment Law matters to employees and a select number of employer clients. Adrian developed a wealth of employment litigation experience in that time, frequently acting as advocate for his clients. He has advised clients engaged in a broad range of private sector industries from manufacturing and mining through to professional services, as well as clients employed in the public sector and not-for-profit organisations. This webinar is suitable for HR professionals and lawyers practising in employment law – Australia wide. This webinar is for practitioners with some knowledge in this area and looking to improve their knowledge.